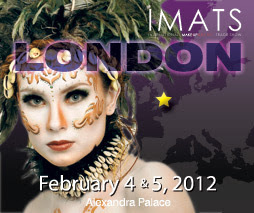 I have never been to the IMATS before and after hearing about it last year- I had to make the effort to attend. It was a fantastic weekend at Alexandra Palace, North London held in a massive exhibition hall where make up lovers from all over the country gather under one roof and shop there heads off! - so much makeup brands are present, trading and showcasing there products- artistic creatives do live body painting and makeup, master classes for those who want to learn the best makeup techniques and many more other exciting and girly things. I attended this year as 'Press' for Shiloh Magazine (as there Beauty Editor) and was escorted with my fabulous Youtube and blogger Friends from the UK. The best thing about the IMATS is those BARGAINS- everything is reduced! Popular brands like MAC, MUD, Illasmasqua, Sleek, Makeup Forever, NYX filled the hall almost halfing the prices of there stock and I had a field day!! I love your hair like this Ama. Hope we get to see some YT vids from you soon.